The houseguests have been on inside lockdown since this morning & will continue to be until tomorrow's live HOH Comp, which we're all 99% positive it'll be an endurance comp! With so much at stake, I have a feeling it's gonna be a loooooong endurance comp!! And in case you didn't know, you can watch the endurance comp *LIVE* tomorrow on the live feeds!! They are super duper cheap @ $10/month!! Those of you who signed up for the live feeds by using the links here on the blog, THANK YOU!!! And all of you who have donated to support the blog, you guys are amazing, THANK YOU!!! I literally could not & would not be here without y'all. So from the bottom of my heart, thank you soooo much!!!!! You guys & gals are truly the best BB fans out there and I am both honored & lucky to have y'all right here on the blog. Candice is the only one who knows what is goingon in the house and not afraid to say it. "It is what it is" lol. Her weeks are numbered in the house, but I would like to see her win HOH to shake up the house. Am I the only one dying to see Helen and Amanda walk out the door?? I really like Judd, I hate that he has become a target. I do hope Julie tells them tomorrow that it is America who wants Amanda out! They all talk about bullying and I feel that Helen and Amanda are just as guilty! I guess I just hate a 1 pony show and I feel that's exactly what it's been the last couple weeks. 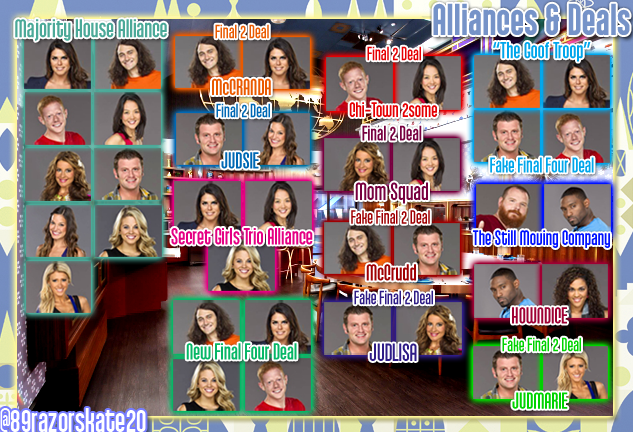 Though its very unlikely I am really pulling for Judd or Candice to be the new HOH! If it's the typical BB endurance comp tomorrow as anticipated which usually favors smaller HGs typically girls or very short small guys then my money would be on Elissa or Helen. And I'd lean towards Elissa since if it came down to the 2 Helen would probably let her have it if she felt she could control her anyway. I am with you, Cody. 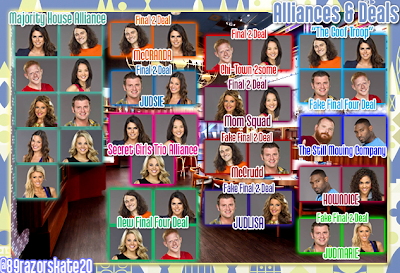 Judd or Candice need to be the next HOH. I want a little change of game play. he cant even win any challenges. Helen and amanda needs to go. They really have turned into bullies. Amanda telling that lie on Howard she needs to be removed on acct of that alone. Aayron needs to use that small brain and get rid of someone who is coming after her and that's not Howard so you made a deal for you to stay in the house. If they are stupid enough to let you stay then they are stupid enough to get blindsided. Your worried that they are gonna come after you guess what they already are. You can't give your hoh to someone else. This is the time to flip the house get Spencer,Gm,Jesse and Judd and flip it bc I would love to see the people in controll get blindsided and if you don't do it this week game over cause you won't have the numbers to win. I loved seeing Amanda getting put up and watching her and mc crea poop themselves and if she does stay this week I will vote for her to go up every week. These outsiders have got to band together this week or they are just gonna get picked off. The people that are in control their getting on nerves their starting to become a nerd herd and I don't like nerd herds. But aayron is not smart so I'm probably not gonna be happy Thursday and I just want Amanda and some of those guys to start taking hits. You could see it she pooped in her pants when she got nominated I loved it. Yes! I too am over Amanda and Helen. They are too confident! I want to see some game shaking otherwise too predictable. I have not been a Candice fan but she's growing on me because she'll shake things up. I'm also hoping some of the floaters blindside the power people and make a big move. Come on Jessie now's your chance to play this game and make a move to shake things up! Don't get sucked into Helen's fake friendliness she's really just manipulating you. Put your insecurities aside and learn a lesson or two from the girl your targeting - Candice! Play this game like a power girl and make a power move! I don't see Amanda or Helen "bullying" anybody. They made good alliances, they cooperate well with other members of those alliances to get out who they want, and they took advantage of a very enticing deal presented to them by Aaryn. Speaking of whom, I'm floored to see how quickly viewers have forgotten or forgiven her bigotry just because she's been keeping a lid on it these past two weeks, and think stronger game players like Amanda and Helen should leave first. If you guys got your wish and they left, exactly what kind of a house would we be left with? Almost everyone else has largely been floating. It's not Amanda's or Helen's fault that BB failed to provide them with any strong competition among the rest of the cast. Two people I am bored with, Helen & Amanda. Send those females out the BB door! Then Spencer, Andy, Jessie cause I mean really,, they're just eh. While I do think Andy is playing one good social game, he's a bit too good. Imo. @Cody - Amanda is my favorite so I'm not with you there but I would be quite happy to see Helen leave. If its endurance, like we are assuming. Then we can't count McCrae out. I'd look for him to be one of the last ones hanging on. If that happens then it'll surely be Judd, Spencer or Candice on the block again this week. Helen's DR sessions drive me nuts! Her facial expressions and head movement make me want to throw things at my tv. Lol! I think it's hilarious on last nights show when Aaryn talks to Amanda after she's been put up as the MVP nom, the first thing she says is, "We know it's not America." How does that even make sense? News flash Aaryn, half of America doesn't understand why everyone is trying to get Howard out! The other half of America is freaking sick of Amanda sitting on her throne ruling the house! Me personally I'm to the point where I don't much care for anybody so it doesn't matter to me one way or another. I voted for Amanda because I want to see some action, drama, and some excitement! I want to see some game changing moves! I want to watch Big Brother not whatever this is supposed to be! McCrae could definitely be a contender depending on what the comp is. He may be too tall to win against the smaller girls like Elissa and Helen judging by past endurance comps. I don't forget for one minute the racist comments from Aaryn. She is a disgusting human being. I can't believe she's still there. Don't get me wrong. I still want Aaryn out ASAP. However, since she is HoH there is no chance of that this week. Just because Aaryn is the person I want out most doesn't mean Amanda isn't a close second.